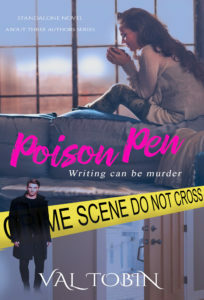 Val’s novel Poison Pen made it to #12 on ReadFreely’s list of the 50 Best Indie Books of 2018. To view the entire list, go to their website at this link. You may need to click the link twice as on the first click their links resolve to the home page. Three wannabe authors suffering from various mental disorders find themselves on a killer’s radar when they interfere in the investigation of a colleague’s murder. Novel-in-progress The Hunted, a full-length sequel to short horror story Storm Lake, has a cover. Thanks to Patti Roberts of Paradox Book Covers and Design, you can get a glimpse of what’s coming. 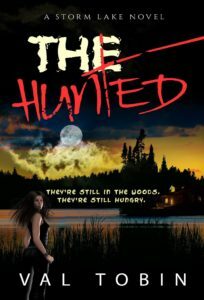 The Hunted picks up the story twelve years after Storm Lake left off. Find out what happened to Rachel, Jeff, and Peter after they left Storm Lake. What awaited them in Peterborough? Did they find Rachel’s father? You’ll find new twists in this thrilling horror story, and learn the true origins of the monsters. 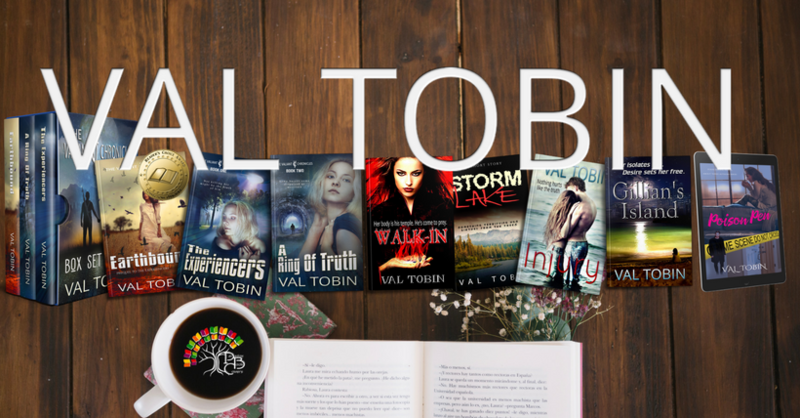 Talented author Melanie P. Smith has created a new book trailer for Val Tobin and her books. Check it out on YouTube. 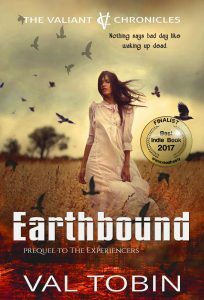 Val Tobin’s Valiant Chronicles prequel, Earthbound, has made the 50 Best Indie Books of 2017 list on ReadFreely. It comes in at #23. View it on ReadFreely. What if you could attend your own funeral? Jayden McQueen’s day begins when she wakes up dead. But that’s the least of her worries. Turns out, she’s a murder victim, and nobody knows it but her. While a work of fiction, Earthbound explores concepts drawn from a variety of teachings, including those of Doreen Virtue, Ph.D., whose courses the author attended in Kona, Hawaii in 2008 and 2010; the author’s education in parapsychic science and parapsychology; and research she did for her master’s thesis on the after-effects of near-death experience. Injury, Available as Free Download, Wins Two Awards, Book of the Month, and Now Shortlisted for ReadFreely’s Best Books We’ve Read All Year Award! 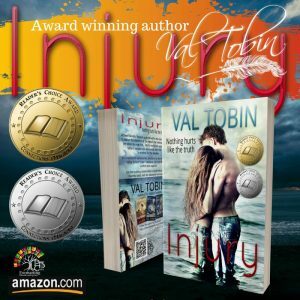 Romantic suspense novel Injury won two awards in the Readers’ Choice contest sponsored by Connections eMagazine. Injury received a first-place Gold in the Romance category and a second-place Silver overall. Injury is available in eBook form as a free download from a variety of retailers. It is also available in paperback. Injury was recently shortlisted for a new award from ReadFreely: the Best Book We’ve Read All Year award. With your help, Injury can win. Part of the process is for readers to vote for the best book. You can view those in the running at ReadFreely’s site and cast your vote. If you could ask your father anything right now, what would it be? Actress Daniella Grayson would love to be able to ask her father anything at all. She puts herself in the spotlight, hoping to attract the attention of the father she believes abandoned her when she was five. Dani’s world falls apart when her father’s remains are discovered, and her mother is arrested for the murder. In a moment of vulnerability, she turns to the handsome and caring Robert “Cope” Copeland, her limo driver, for comfort and support. Can the budding relationship survive betrayal, Dani’s shameful past, and her obsessive ex-boyfriend? Val’s next project is a non-fiction book on the after-effects of near-death experience. While the release of the book is still months away, Val’s cover designer, Patti Roberts of Paradox Book Cover Designs has been hard at work creating a new cover for it (see image at left). What do you think? Isn’t it gorgeous? 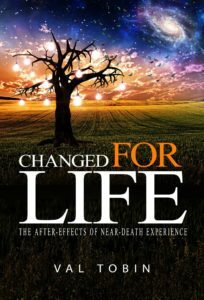 The title of the new book is Changed for Life: The After-Effects of Near-Death Experience. Every Year, millions of people have a near-death experience (NDE) and return from it altered permanently. Whatever the truth about the experience itself might be, there is no denying the changes that occur at every level: mental, emotional, physical, and spiritual. The results are positive if the experiencer is able to process the event in a healthy way. However, some experiencers have difficulty integrating the changes into their lives, which can adversely affect relationships. Researchers, such as Dr. Raymond Moody, Dr. Kenneth Ring, and P. M. H. Atwater, have found that subjects experience a host of similar after-effects from an NDE regardless of how the NDE was induced. As well, non-experiencers can benefit from the NDE phenomenon if, according to Ring, they are exposed to NDE research and stories, or if they consciously work to emulate NDEr beliefs and values. Dr. Raymond Moody has found similar effects on non-experiencers through the process of mirror-gazing. Humanity stands to benefit from further NDE research and, in particular, from studying NDE after-effects.